As someone who communicates with VO donors daily, I’m inspired over and over by their generosity. Today, I’m also inspired by their cooking skills! 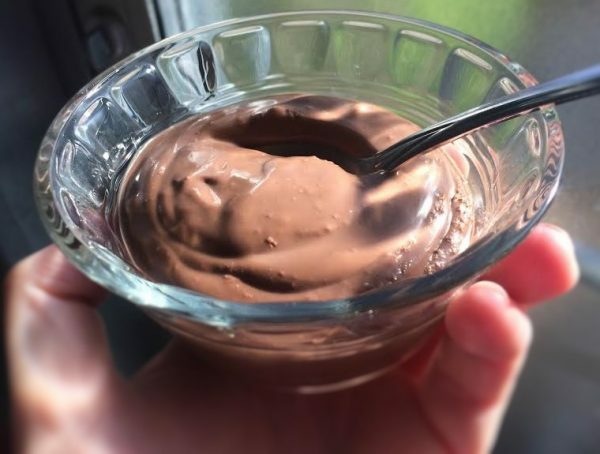 Becky Rose, a wonderful donor, mentor, and leafleter in Oregon, was gracious enough to send me her recipe for vegan chocolate mousse to share with all of you. In true Becky fashion, this recipe is straightforward, not too difficult, and utterly fantastic! You can experiment with the amounts of basil and orange, to your liking. And Becky says this recipe is a crowd-pleaser, and I can attest to that! I made it earlier this week and it’s delicious! Becky prepares the mousse to share at potlucks, family gatherings, and work events. If you do too, be sure to bring copies of the recipe with you, because everyone will ask for it! Enjoy! Heat the coconut milk in a pan on the stove until it’s just about to boil. While the coconut milk is heating up, coarsely chop the chocolate bar(s) and put it in a blender (or just open your bag of chocolate chips and dump them in). When the coconut milk is hot, pour over the chocolate in the blender. Add the remaining ingredients and carefully blend until smooth and creamy. Strain through a fine-mesh sieve to catch the big pieces of orange rind, pepper, and basil. Put in a bowl or individual dishes and refrigerate for a couple hours until set. This recipe was adapted from one in Alan Roettinger’s cookbook, Speed Vegan.